Chris Sharp MFC of Sharps Custom Canvas Inc. designed and manufactured this enclosure project using Riviera Marine Fabric and Strataglass. This project was an entry in the "Tops and Enclosures 29 and Under" category at the 2016 Fabrication Excellence Awards at the MFA National Convention. Make and install a new seven section front enclosure and nine section campertop with an enclosure off the hard top. The front windows will attach to the hard top with a zipper flap. Build a new horizontal camper top “hoop style” from scratch with 1 1/4” stainless and a zipper flap for the 9 windows. 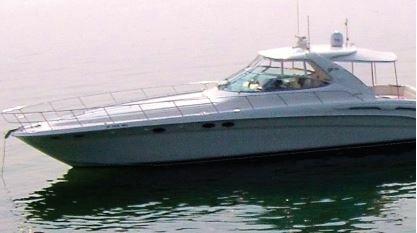 The customer uses the boat for big events and entertainment. Everytime time this boat leaves the slip there is always guest or customers aboard. They had an aft curtain that spanned from the hardtop to the back of the boat and when it was up the cockpit was to small to accommodate a large number of people. So we were asked to make the cockpit bigger but they didn’t want to lose the sporty look of the boat. The customer made it very clear that he did not want to make his boat look like all the other Sea Rays. What was unique or complex about the process? The size of the frame made it difficult to transport from our shop to the marina. During the install of the frame, we realized that we would have to add dog legs in the bow to eliminate it rubbing against the arch. Once the massive frame was set and the supporting stanchion rods were in place, it was all down hill! The rear enclosure turned out awesome and made the boat feel so much bigger. The customer loved being able to pull three of the front enclosure windows back to the hard top for ventilation. The project overall was exactly what the customer was looking for to keep guests comfortable and increase the living space of their boat. Strataglass with Herculite Riviera Marine fabric together makes a long lasting and durable enclosure. Interested in learning more about Herculite's Rivera Marine awning fabric? Fill out this form to request a quote or fabric sample, or call us directly at 800-772-0036.